Many of the scarves and wall hangings/tapestries I print are custom sizes. This chart would be much too long if all options were listed. Email donnalee.digitalsilk@gmail.com for a quote for any size on fabrics I carry. PRICES IN THE COLUMNS ARE FOR UN-HEMMED PRINTS. THE PRICE TO HAND HEM ARE IN THE BOTTOM OF EACH COLUMN IN A DARKER COLOR. Sizes listed are commonly found in scarves. Custom sizes welcome. 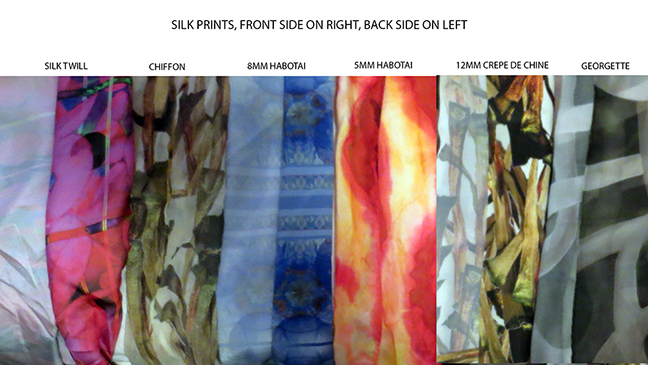 Popular silks for scarves are listed below, see fabrics or wall hanging (below) and pages for more options. Charmeuse has become available once more in 12mm and 22mm weights. For duplicate prints at the same time of the above sizes, a 10% discount will be given for the duplicate print(s). up to 13 inches wide Three of the sizes below that are printed together for savings - can be different images, both the same size and same fabric. And must be printed at the same time for these prices. Any of the other available fabrics can be printed as long & narrow scarves. If don't see the size in the fabric you want, email for a quote. Most wall hangings usually require heavier silks than scarves do. A wide hem will be added at the top, or top and bottom if requested, to hang with. Inquire for specific sizes but some common sizes and fabrics below. Prices below are unhemmed. Hemming @ $2.25 / foot around sides, plus an extra edge length at the top, or top and bottom if a wide hem is needed..
is the width of the roll - 40 to 41 inches. We offer only HAND HEMMING. If you want to finish the edges yourself, be aware that silk ravels easily and edge treatment must be done as soon as possible with as little handling of the fabric as necessary. Hemming prices are based on the length of the print parameter - (linear feet around the sides) No maximum size limits. And.........and hem is ........stupendous!!!!!! ..........I'm SO impressed with this hem!!!!!!!!!!! It is SO wonderful and SO well done! Note on this picture you can see the 'back sides' of the fabrics. On the left is 8mm habotai - essentially no difference front & back. 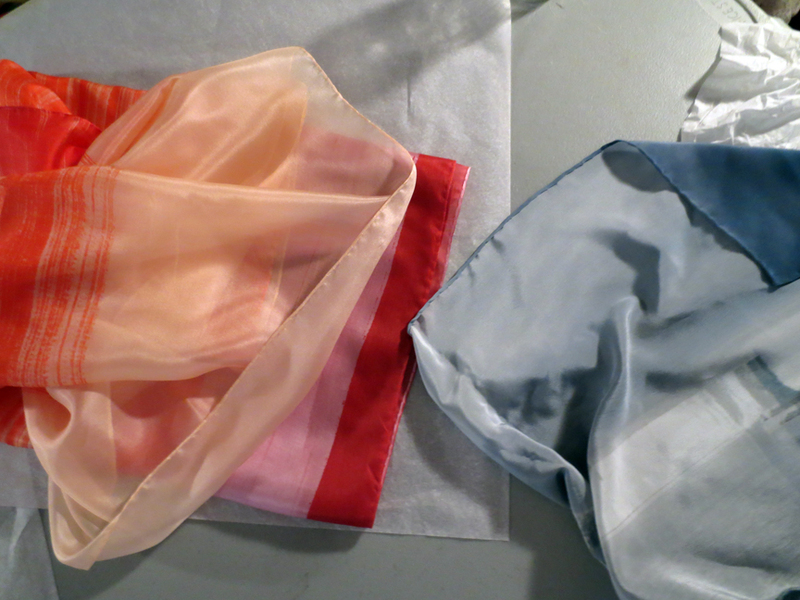 On the right is silk twill. You can see there is a definite right/wrong side as in most fabrics you wear. Occasionally someone asks for the hem to be rolled toward the front, rather than toward the back. This does not work well except with the heavier fabrics, and the color of the hem will be the color of the backside, usually rather grayed out, as seen on the right scarf here. I can also send swatches of the fabrics so you can see and feel them for yourself. Email your mailing address.- these are free unless you want your own image printed. Why a minimum price? Because the amount of fabric in a print is only a part of the overall cost to print an image. It takes as long to print a 8x10 print as to print a 16x20 print. Want a different size? email for quote. Prices are based on the square feet of the final print, in addition to the basic cost to print as noted above.. Custom sizes will be approximately the price as a similar size (square feet) listed. There is no extra cost to print a custom size. Most weaves of silk are available in 42" width. Chiffon and organza are 40 inches wide, 23mm chepe de chine is 41" wide. Gauze is 36" wide, Rayon, Belgian linen and cotton are in 44 inch widths. That noted, rolls of silk can't be printed to the very edge, the printer needs about an eighth of an inch on the sides unprinted, and composite prints must accommodate space between the images for cutting & hemming. We are not a commercial printing operation. We do not use a chemical process, such as a 4-color press. We print every scarf individually and each is hand-hemmed. For this reason we must limit multiples to no more than ten (10) per order to have them arrive to you in a timely manner. Inquire for turn-around time if you need more. I will need a large file, full size in inches if possible and at high resolution (no 72 dpi files as they won't print well). I print at 360ppi resolution. You may send by email, or through an image transfer site. There are several websites offering services of sending large files. 1) We have your image file. 2) We have your payment through Paypal or otherwise discussed in advance. 3) Typically your print will be done a day or 2 after your file is received. If you have not requested hemming, the print will be shipped to you as soon as possible. I go to the post office twice a week, on Tuesdays and Fridays. 4) Your print is taken to the finisher (seamstress) to hem. Let us know if you have a deadline you need your print by. Especially if you are ordering more than one at a time. We can accommodate - even in holiday season. Just let us know. In general, allow a few days before we can ship your print. If it is possible to do this faster, we will. For orders of several scarves it could take up to two weeks to ship to you, depending how many other orders are in queue. We had not been charging handling costs - all shipping costs have been only for the actual postage ( FedEx or USPS) plus the container cost. Postage has gone up once more. There are other hidden costs in shipping such as paying someone's time boxing and labeling and it has come to the time we have to charge handling as well as actual postage as in the past. Shipping will still be Priority mail, unless FedEx is requested. Currently 1 or 2 large scarves ( or more small ones) in 1" high flat box, shipping and handling will be $11, priority mail, which includes tracking. Larger, heavier fabric or multiple prints are shipped in 2" high boxes, shipping costs vary depending on weight up to app;roximately $16.00, priority mail which includes tracking. For heavier boxes or if you want to ship FedEx, prices can be well over $25.00. The best way for a quick response from me is email which I check several times a day.